I recently undertook the Devon Coast to Coast cycle. I highly recommend this 99 mile trip from Ilfracombe to Plymouth. Mainly off road or on quiet lanes, the route included some lovely countryside and went through some picturesque villages and towns. One of these towns that impressed me was Tavistock near Dartmoor. There were some quite impressively large buildings such as the grand town hall for a small town. Of course, all the cycling had made me hungry! Naturally I went for a wander down the high street to see what the pie options were. 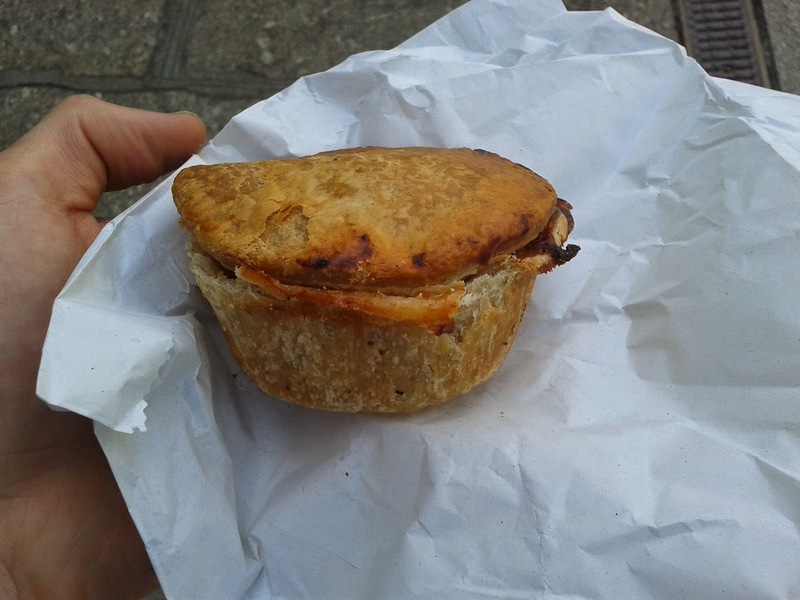 Pleasingly I found the butchers 'Palmers of Tavistock' had a large range of pie options. I grabbed a Pork Pie for £1.60 and a Hommity pie for £2.40. Saving the Hommity pie for later I tucked into the pork pie, it might not have been a Melton Mowbray Pork Pie but it did hit the spot. See the breakdown of scores below. Condition - 3.4 out of 7 - A bit of an ugly duckling, this pie was certainly heavy on the handmade charm. There was a bit of boil out. It wasn't pretty but I kinda liked it. 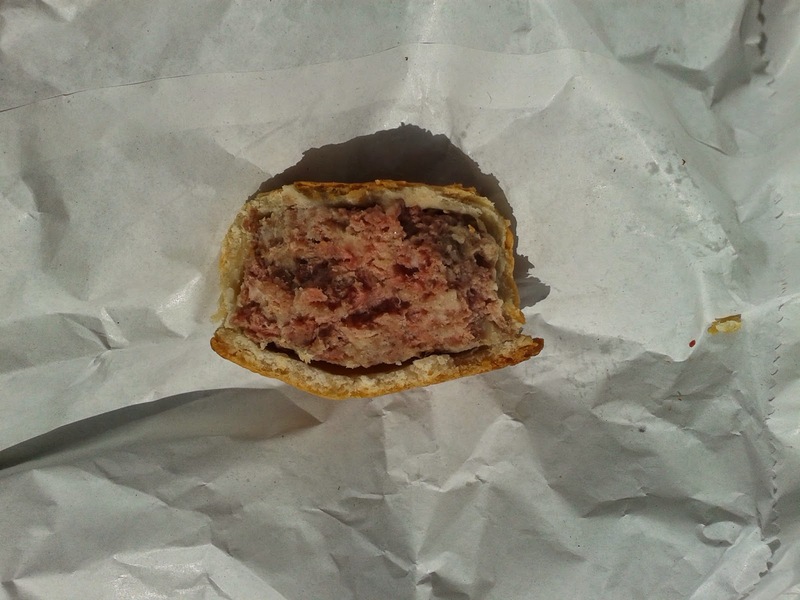 Cheapness - 3.5 out of 7 - This was a medium sized pork pie, so the price wasn't too dissimilar to what you pay in a supermarket, there was a lot of filling for the money. Chewiness - 5.5 out of 7 - The pork was satisfyingly granular but not chewy. There was a nice crunch to the outside of the pastry and softness in the middle. Content - 4.5 out of 7 - I enjoyed the content but would have liked a bit more seasoning. The pinkness to the meat revealed it was cured meat. Consistency - 5.5 out of 7 - A nice consistency, it worked well as a package, handmade by Palmers themselves (and you could tell). While not exceptional, this was a good pie and given that they have a large range of pies to choose from, I would visit Palmers again.